Gerardo Zaffino villain variant. Cover Artist: Gerardo Zaffino. Release Date: December 5, 2018. The coming of X-Man?. Publisher: Marvel Comics. Interior Artist: Joe Madureira. Cover Artist: Joe Madureira. We are always buying! Special Notes: This issue is a First Printing! What you see in the pictures is what you will be getting. FAST AND SAFE ALL THE BOOKS YOU WANT AT ONE LOW PRICE! Marvel UNCANNY X-MEN (Mar 1979) #119 KEY Byrne Art PHOENIX VF/NM 9.0 Ships FREE! DOUBLE SIGNED BY CHRIS CLAREMONT & BOB MCLEOD in GOLD. Special Notes: This issue is a First Printing! PUBLISHER: Marvel Comics. Acceptable minor defects on a NM copy include: A very small amount of spine stresses without color breaks, very minor instances of denting (two or three at most), slight corner blunting, and minor (less than 1/8") bends without color breaks. Release Date: January 16, 2019. Artist: Pere Perez. Publisher: Marvel Comics. Release Date: November 21, 2018. Artist: R. B. Silva. I WILL DO WHATEVER IT TAKES TO RECIFY THE SITUATION. THE PHALANX (FOIL COVER). #320-LEGION. ROGUE,ICEMAN, BEAST. Release Date: December 19, 2018. The coming of X-Man?. Publisher: Marvel Comics. There are four issues that have noteworthy condition issues that could put them into a lower grade This is the COMPLETE SERIES RUN. #15 has a couple of creases/wrinkles on the cover at the top left corner. You are looking at a very rare item. This issue has a holo-graf foil cover and is signed by artist John Romita Jr. This is the case with this issue. I still have the program as proof. The program is not for sale. Release Date: November 28, 2018. Publisher: Marvel Comics. PUBLISHER: Marvel Comics. 1993, Forge, Mystique & Trevor Fitzroy appearance. Acceptable minor defects on a NM copy include: A very small amount of spine stresses without color breaks, very minor instances of denting (two or three at most), slight corner blunting, and minor (less than 1/8") bends without color breaks. Book is NM with just a touch of wear on the upper right front corner and will make an excellent addition to your collection. 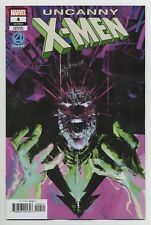 UNCANNY X-MEN #9 MARVEL comics NM 2019 Ed Brisson ❌❌❌ 1 LEFT! 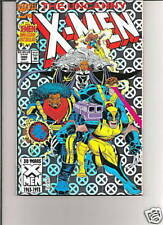 This is a high quality copy of Uncanny Xmen 9 and a great add to any collection. Grab this issue today before it is gone and enjoy. Also check out my other comics and auctions. All comics packaged to arrive the way they are purchased with bag and board. Interior Artist: Bachalo. Writer: Bendis. Special Notes: This issue is a First Printing! This is the Irving 1 in 50 variant! Cover Artist: Irving. We are always buying! What you see in the pictures is what you will be getting. Cover Artist: Jae Lee. This issue is a limited edition variant cover. The print run was 15,000! This is a DF Cover, But no DF COA is included. We are always buying! Special Notes: This issue is a First Printing! I do not assign the grades 9.9 and 10.0 to any unslabbed "raw" comics. You will only see these ultra-high grades on comics slabbed by one of the grading services. There is such a small degree of separation between the grades 9.8, 9.9, and 10.0 that even the most experienced comic graders may disagree on which of these three grades to assign to an apparently flawless comic, so the highest grade I will assign to a comic is 9.2. 1993, "Death" of Illyana Rasputin (Magik). I do not assign the grades 9.9 and 10.0 to any unslabbed "raw" comics. You will only see these ultra-high grades on comics slabbed by one of the grading services. Penciller: Ian Churchill. Cover Artist: Ian Churchill. 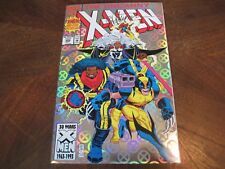 X-Men Lot of 24 with Various X-men Titles All Books In VF/NM Condition! PUBLISHER: Marvel Comics. 1992, Scott Lobdell story, Whilce Portacio & Scott Williams cover & art. Acceptable minor defects on a NM copy include: A very small amount of spine stresses without color breaks, very minor instances of denting (two or three at most), slight corner blunting, and minor (less than 1/8") bends without color breaks. Scott and Logan are together again, and they are mutantkind's only hope. Artist: Salvador Larroca. Release Date: February 6, 2019. Writer: Matthew Rosenberg. PUBLISHER: Marvel Comics. Comic Books, Graphic Novels, Trading Cards… And More! Acceptable minor defects on a NM copy include: A very small amount of spine stresses without color breaks, very minor instances of denting (two or three at most), slight corner blunting, and minor (less than 1/8") bends without color breaks. See item condition for more info. See scan for more details. What you see is what you get. 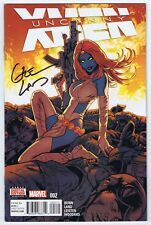 Both signatures were obtained from the Long Beach Comic Con in 2015. We do combine s/h on multiple orders. Cable # 3 ( 1st Weasel) & 15 ( 1st Marrow). Marvel Comics. Had this signed as a child in Hawaii. The Uncanny X-Men #354 (Apr. 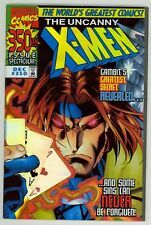 1998, Marvel) NM (9.4) Phoenix Variant Cover !!!! !